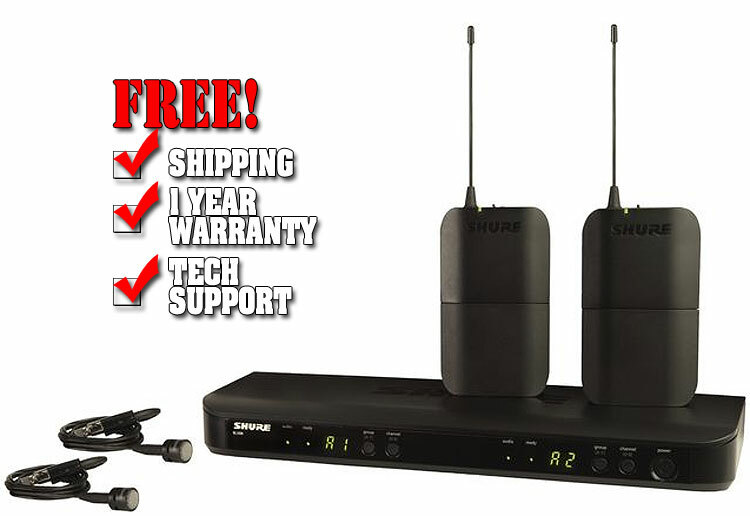 This package contains two BLX1 bodypack transmitters, two PG185 lavalier microphones, and a BLX88 dual-channel receiver. The BLX1 bodypack transmitter works with lavalier and headset microphones, and also has an input for guitar. The beltpack features an On/Off hard toggle switch, preferring to eliminate the multi-function push button that is used on some wireless transmitters. The BLX88 diversity receiver is a wholly independent, two channel wireless receiver with discrete outputs (1/4"/XLR) for each channel. It is equipped with several features usually found on more expensive models, including Shure's One touch QuickScan, which instantly locates the best open frequency. The PG185 lavalier microphone is a cardiod lav condenser specially designed for wireless applications. Comes with clip and windscreen.